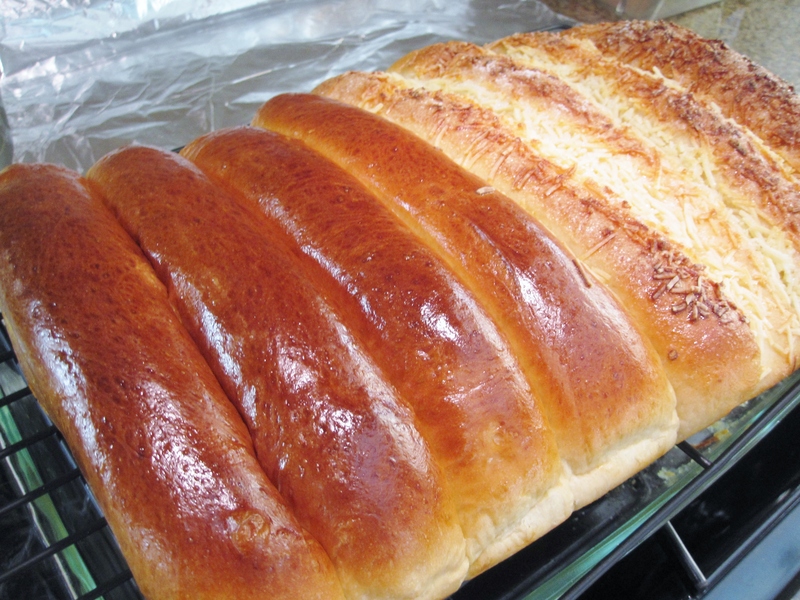 Pai Pau 排包 is translated as row of bread, and it is a popular bread in Hong Kong. I always get my pai pau from Kee Wah Bakery, they are soft buttery and fluffy soft. When I eat it, I always warm the bread up briefly in microwave then lightly toast the surface, then spread some butter on it– mmm, it’s so delicious! This time, I decided to make my very first pai pau. Pai pau recipes online all require starter. I chose this recipe from Lily’s Wei Sek Hong, as it takes less time to make the starter. As always, I modified the recipe a little hehe… Next time I will try the other recipe that uses a different starter. Also, since I just love Asiago cheese and sugar on baked bun generally, I sprinkled some Asiago cheese and sugar on half portion of the pai pau. How did my pai pau turn out? First, the look: the bread turned out pretty good and even in size. For some reason it takes longer to brown the half with cheese. So, when the ones with cheese were browned, the other half plain ones were a little too brown. Next time, I should bake them in separate trays. The taste? Well, my pai pau are soft enough, with a little chewiness. But compared to ones from Kee Wah Bakery, they are not as fluffy and buttery. Also the bread doesn’t look as yellowish as those from the bakery. Hmm… I wonder if Kee Wah Bakery adds anything “special”? Combine bread flour, milk powder, sugar, salt and dry yeast in the stand mixing bowl. Add in remaining ingredients (except butter and egg wash). With a dough hook attached and the mixer turn on, knead the dough until it forms a dough. Add a little more milk if necessary. Drop in butter and continue to knead the dough until it doesn’t stick to the bowl and pass the “membrane” test. (pull a small piece of the dough, use two hand to stretch the dough to a very thin layer– if the layer doesn’t tear then the dough is ready to proof. Otherwise, continue kneading until it passes the test). 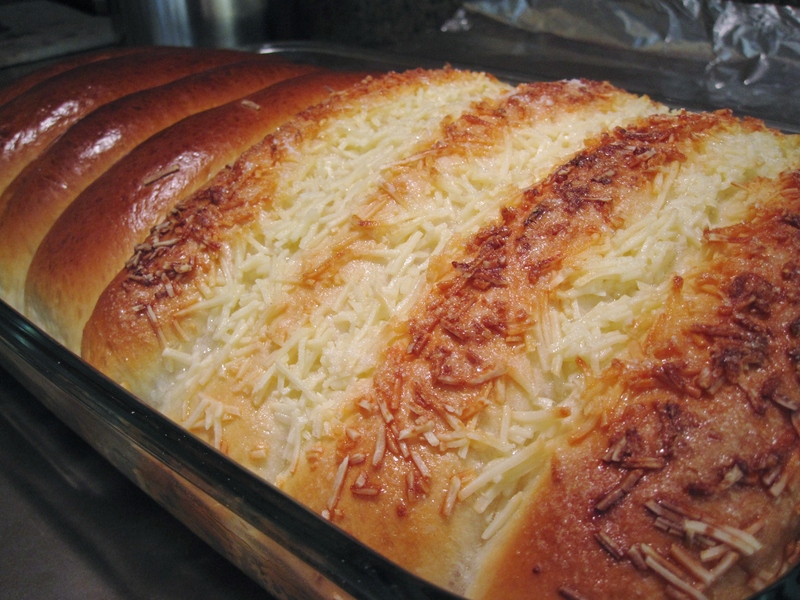 Lightly knead the dough on a board a few times to punch out big air pockets trapped inside. Divide into 8 even portions. Roll each pieces into a ball. Use a rolling pin, roll out 1 pieces of dough to a oval shape. Fold 1/3 of the dough on the top towards the center. Then fold the bottom 1/3 over, on the center. Pinch to seal the edge. Roll and gently stretch the dough to 7 inches long. Repeat with the remaining pieces of dough. Place them on greased 9x13x2 baking pan. Cover with plastic wrap and let it rest till the dough almost reach the rim of the pan. Apply egg wash on top of the buns. Bake in preheated 350°f oven for 25-30 minutes until golden brown. Remove from pan and cool on a rack.